Context: The initial bond strength and potential durability of an adhesive restoration are significantly affected by regional variations in dentin composition. Aim: The aim of this study is to evaluate the influence of dentin location and thermomechanical cyclic loading on microtensile bond strength of bulk-fill composite resin to coronal dentin. Materials and Methods: Disto-occlusal cavity preparations were done on 60 extracted human mandibular molars with pulpal floor depth of 1.5 and 3.5 mm for superficial and deep dentin and 1.5 mm axial wall depth and are restored with bulk-fill restorative composite. Bond strength evaluation was done using universal testing machine, and mode of bond failure was observed under scanning electron microscope. Statistical Analysis: Statistical analyses were done using ANOVA and Tukey's multiple post hoc test. For comparison of failure mode, Mann–Whitney U-test was used. Results: Superficial dentin has shown higher bond strength compared to deep dentin and gingival wall dentin (P = 0.001). The bond strength values decreased with the thermomechanical cycling (P = 0.001). Deep dentin and gingival dentin have exhibited more of adhesive failures. Conclusion: Bond strength of bulk-fill composite was negatively influenced by the depth of dentin and thermomechanical loading. Dental composite that can mimic the natural teeth has become the restorative material of choice for replacing the lost or damaged tooth structure. However, durability of restoration should be the most important criterion in material selection, as longevity of posterior composite restoration is considered less than optimal. An annual failure rate reported for posterior composite restorations has ranged from 0% to 9%. Secondary caries and marginal breakdown are the most frequent causes cited for the replacement of composite restorations. Interface between the restoration and the tooth is exposed to diverse forces during function. It was reported that degradation occurs rapidly within 6 months throughout the dentin-bond interface leading to bond failure due to bacterial biochemical activities and thermal or mechanical load stresses., Host-derived matrix metalloproteinases (MMPs, mainly MMP-2 and MMP-9) have been reported to play a major role in the collagenolytic activity within the hybrid layer during aging. The distribution of these matrix metalloproteinases was found to be different with different depths of coronal dentin indicating their different proteolytic potentials. The application of in vitro methodologies using thermal and mechanical stresses to simulate the conditions in the oral environment could enable better evaluation of adhesive materials exposed to stresses. The rationale behind bond strength testing is that the higher the actual bonding capacity of an adhesive restoration, the better it will withstand functional stresses and the longer the restoration will survive in vivo. Hence, the present study was designed to evaluate the influence of dentin depth, location, and tubule orientation on the bond stability of bulk-fill composite resin under thermomechanical challenge. Sixty noncarious human mandibular molars of approximately similar dimensions were collected and were used within 2 months after the extraction. Preoperative radiographs were taken to ensure that the collected teeth did not have root caries, pulpal calcifications/resorptions, or fractures/craze lines. After extraction, teeth were disinfected using 0.5% chloramine-T solution and their use in research was approved by the local biomedical research ethics committee (D158601032). Standardized disto-occlusal cavities were prepared using # Ex 41 diamond abrasives (Mani Utsunomiya, Tochigi, Japan) and # 245 tungsten carbide burs (SS White, New Jersey, USA). Each bur was changed after every five cavity preparations. Superficial dentin was prepared with a depth of 1.5 mm and deep dentin with 3.5-mm depth from the occlusal central fossa. Gingival floor was placed 1 mm above the cemento-enamel junction, and the depth of the axial wall was maintained at 1.5 mm from the external surface. The cavosurface margins were prepared at 90°, and all the internal line angles were rounded. Application of etchant (Eco Etch – 37% phosphoric acid, Ivoclar, Schaan, Europe) was done first on the enamel walls and then to dentin so that 20-s etching time for enamel and 10 s for dentin were maintained. Then, single bond universal adhesive (3M ESPE, St. Paul, MN, USA) was applied and light cured using Bluephase C8 LED-curing unit (Ivoclar Vivadent, Schaan, USA). Filtek bulk-fill posterior restorative composite (3M ESPE, St. Paul, MN, USA) was placed as a single increment of 4-mm thickness into the prepared cavities and light cured for 20 s. Restorations were finished with Sof-Lex discs (3M ESPE, St. Paul, MN, USA), and polishing was done using rubber cups at slow speed. After the restorative procedure, teeth were randomly allocated into two groups (n = 30 each). Group 1 teeth samples were stored in distilled water at 37°C for 24 h and 100% humidity after which they were assigned for immediate bond strength testing. Group 2 teeth samples were subjected to thermomechanical cyclic loading after embedding their roots in cold-cure polystyrene resin in order to obtain a flat occlusal surface for mechanical load application. The teeth were thermally stressed in a Wileytec thermocycler machine (Haakeek 30, Thermo electron Corporation, Germany) at 5°C in cold cycle followed by hot cycle at 55°C for 10,000 cycles with a dwell time of 30 s and the transfer time of 5 s. The specimens were submitted to one lakh mechanical cycles with an intermittent vertical occlusal loading of 50 N at 20 cycles/min. With a chewing simulator CS-4.8 (SD Mechatronik, Germany), the axial force was applied with a round end piston of 5-mm diameter that touched the occlusal internal cuspal inclines at 1 HZ frequency. The restorations were sectioned along the long axis of the teeth into three slabs with a slow-speed diamond saw (Leica SP1600, Germany) under copious water coolant. These specimens were then trimmed and shaped to produce three beams of 0.9 mm ± 0.1 mm bonded surface area, so that one section each from superficial dentin, deep dentin, and gingival floor were obtained, with a total of 90 sections from each group. The specimens were then mounted with a cyanoacrylate adhesive in a universal testing apparatus (Autograph, AG-15, Shimadzu Inc., USA) and debonded at a crosshead speed of 1 mm/min until failure. Mean bond strength values and standard deviations were calculated and expressed in MPa. Statistical analysis was performed with SPSS software version 22.0 (IBM Corp, Armonk, NY, USA) using ANOVA and Tukey's post hoc test at a significant level of 5%. All fractured specimens were dry mounted on aluminum stubs, gold sputter coated (ion sputter coater, Hitachi E-1010), and observed with a scanning electron microscope (LJSM 5600, Joel Inc., MA, USA) to evaluate the fracture pattern. The predominate fracture modes observed were classified into three types: Adhesive/cohesive/mixed failures [Figure 1]. The percentage of failure modes was calculated; Fischer's exact Chi-square and Mann–Whitney U-tests were used with α = 5%. For all the dentin regions, bond strength values were significantly lower when the specimens were submitted to thermal and mechanical cyclic loading (P = 0.001) [Table 1]. 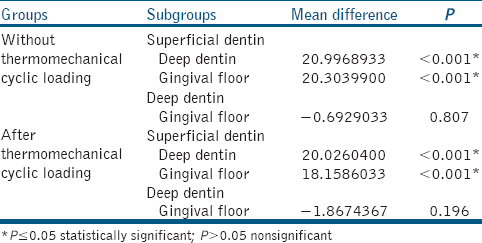 Higher mean bond strength was recorded for superficial dentin and has shown statistically significant difference compared to deep and gingival dentin (P = 0.001) [Table 2]. Gingival floor presented lower bond strength values but did not show significant difference compared to deep dentin (P = 0.807). Without thermomechanical load cycling, the mode of failure was not statistically different in different dentinal regions (P = 0.079) [Table 3]. Superficial dentin has shown more number of cohesive failures without and after thermomechanical loading. Deep dentin and gingival wall dentin have exhibited more of adhesive failures. In all the tooth regions, the percentage of mixed failures were increased after thermomechanical cyclic loading, which has shown statistically significant difference in the fracture mode within the dentin regions (P = 0.001). While placing a composite restoration, the incompatibility between the strong demineralizing ability of acid etchant (37% phosphoric acid) and the insufficient infiltration of the hydrophilic monomers may develop a gap below the hybrid layer causing the exposure of certain amount of collagen fibrils and matrix-bound MMPs. These MMPs activated by the acidic monomers may induce the degradation of the denuded collagen on thermal changes during aging. Niu et al. reported that the distribution of MMP-2 and MMP-9 was reduced from the deep dentin to superficial dentin, but the distribution of their specific tissue inhibitors of metalloproteinases were not commensurate with that. Hence, to stimulate intraoral functional environment on the restorations, thermomechanical cyclic loading procedures as per the guidelines given by the Academy of Dental Materials for in vitro testing were performed in the study. The results of the study confirmed the research hypothesis, as the dentin region and the depth of dentin proved to be influencing factors on bond strength values. Superficial dentin demonstrated higher bond strength values than deep and gingival dentin, which is in accordance with previous studies., Superficial dentin contains fewer and tapering dentinal tubules, whereas deep dentin is composed mainly of larger funnel-shaped dentinal tubules with minimum intertubular dentin. To establish good bond, permeation of the resin into intertubular dentin by hybrid layer formation is more important than resin tag formation in dentinal tubules. In clinical scenario, the presence of greater amount of dentinal fluid in deep dentin may further decrease the bond strength values. Contrary to these findings, some studies have shown that the deeper dentin is capable of producing higher bond strength due to an increase in the total surface area available for forming hybridized tubule walls and intertubular dentin., In another recent study, no significant difference in bond strengths was reported between superficial and deep dentin. Gingival wall has shown lowest bond strength values among the tested tooth regions. Gingival wall presents the dentinal tubules that run obliquely and parallel to the preparation; as a result, greater amount of peritubular dentin and only a smaller area of intertubular dentin are available to form the hybrid layer. Apart from that, due to less mineralized dentin at the gingival margin, acids are expected to etch dentin at the gingival wall faster. In clinical conditions, Perdigão stated that patent tubules with dentinal fluid may contaminate the prepared surface leading to reduced adhesive infiltration and lower monomer/polymer conversion of the adhesive at the gingival margin as compared to the proximal wall. In agreement with other studies,, the bond strength values were decreased in all dentin regions after thermomechanical cyclic loading indicating bond degradation with aging. Although hydrophilicity of the adhesive and water sorption of adhesive interfaces are considered the principal mechanism of resin bond degradation, enzymatic degradation of hybrid layer by MMPs contribute to the degradation process and loss of bond strength with time.,, It was reported that released carboxy telopeptides from type 1 collagen values in deep dentin were higher than those in superficial dentin and exhibited higher MMP activity and collagen degradation during thermocycling process. Failure mode analysis revealed that independent of depth of dentin, thermomechanical cyclic loading increased the number of mixed failures due to the partial degradation of resin-dentin interface with aging. These findings are in accordance to the study results of Mitsui et al., where the number of mixed failures were increased with increasing number of thermomechanical cycles. Due to the partial degradation of resin-dentin interface with aging, mixed failure mode exhibited some cohesive and some adhesive fractures. After thermomechanical cyclic loading, the gingival wall exhibited significant resin-dentin bond degradation as compared to superficial dentin. The findings of the study indicate that adhesive restorations might experience early leakage or bond failure at some preparation walls. Opdam NJ, van de Sande FH, Bronkhorst E, Cenci MS, Bottenberg P, Pallesen U, et al. Longevity of posterior composite restorations: A systematic review and meta-analysis. J Dent Res 2014;93:943-9. Ástvaldsdóttir Á, Dagerhamn J, van Dijken JW, Naimi-Akbar A, Sandborgh-Englund G, Tranæus S, et al. Longevity of posterior resin composite restorations in adults-A systematic review. J Dent 2015;43:934-54. Carvalho RM, Fernandes CA, Villanueva R, Wang L, Pashley DH. Tensile strength of human dentin as a function of tubule orientation and density. J Adhes Dent 2001;3:309-14. Cavalcanti AN, Mitsui FH, Lima AF, Mathias P, Marchi GM. 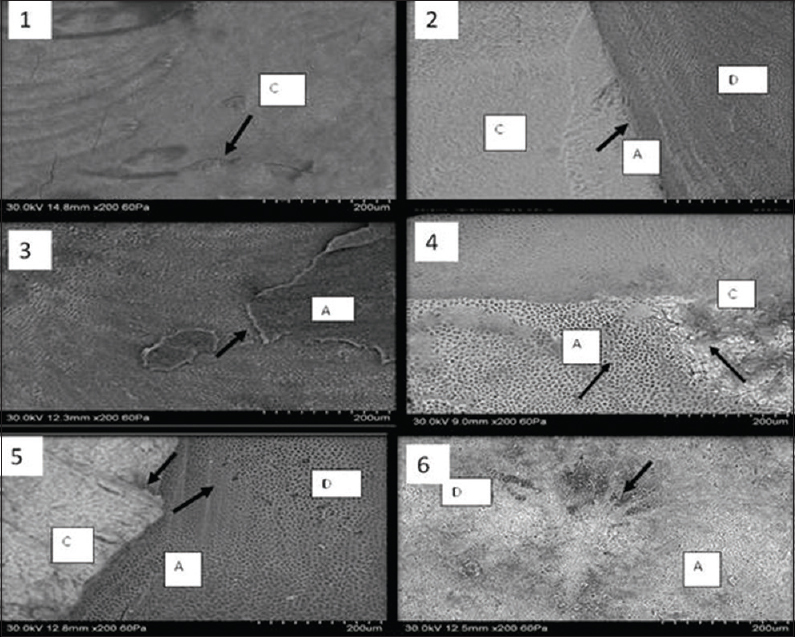 Evaluation of dentin hardness and bond strength at different walls of class II preparations. J Adhes Dent 2010;12:183-8. Perdigão J. Dentin bonding-variables related to the clinical situation and the substrate treatment. Dent Mater 2010;26:e24-37. Schiltz-Taing M, Wang Y, Suh B, Brown D, Chen L. Effect of tubular orientation on the dentin bond strength of acidic self-etch adhesives. Oper Dent 2011;36:86-91. Ferracane JL. Models of caries formation around dental composite restorations. J Dent Res 2017;96:364-71. Kopperud SE, Tveit AB, Gaarden T, Sandvik L, Espelid I. Longevity of posterior dental restorations and reasons for failure. Eur J Oral Sci 2012;120:539-48. Czasch P, Ilie N. In vitro comparison of mechanical properties and degree of cure of bulk fill composites. Clin Oral Investig 2013;17:227-35. Algamaiah H, Sampaio CS, Rigo LC, Janal MN, Giannini M, Bonfante EA, et al. Microcomputed tomography evaluation of volumetric shrinkage of bulk-fill composites in class II cavities. J Esthet Restor Dent 2017;29:118-27.
van Dijken JW, Pallesen U. A randomized controlled three year evaluation of “bulk-filled” posterior resin restorations based on stress decreasing resin technology. Dent Mater 2014;30:e245-51. Jung JH, Park SH. Comparison of polymerization shrinkage, physical properties, and marginal adaptation of flowable and restorative bulk fill resin-based composites. Oper Dent 2017;42:375-86. Pallesen U, van Dijken JW, Halken J, Hallonsten AL, Höigaard R. Longevity of posterior resin composite restorations in permanent teeth in public dental health service: A prospective 8 years follow up. J Dent 2013;41:297-306. Liu Y, Tjäderhane L, Breschi L, Mazzoni A, Li N, Mao J, et al. Limitations in bonding to dentin and experimental strategies to prevent bond degradation. J Dent Res 2011;90:953-68. Niu LN, Zhang L, Jiao K, Li F, Ding YX, Wang DY, et al. Localization of MMP-2, MMP-9, TIMP-1, and TIMP-2 in human coronal dentine. J Dent 2011;39:536-42. Mitsui FH, Peris AR, Cavalcanti AN, Marchi GM, Pimenta LA. Influence of thermal and mechanical load cycling on microtensile bond strengths of total and self-etching adhesive systems. Oper Dent 2006;31:240-7. Armstrong S, Breschi L, Özcan M, Pfefferkorn F, Ferrari M, Van Meerbeek B, et al. Academy of dental materials guidance on in vitro testing of dental composite bonding effectiveness to dentin/enamel using micro-tensile bond strength (μTBS) approach. Dent Mater 2017;33:133-43. Pegado RE, do Amaral FL, Flório FM, Basting RT. Effect of different bonding strategies on adhesion to deep and superficial permanent dentin. Eur J Dent 2010;4:110-7. Lopes GC, Perdigão J, Lopes Mde F, Vieira LC, Baratieri LN, Monteiro S Jr., et al. Dentin bond strengths of simplified adhesives: Effect of dentin depth. Compend Contin Educ Dent 2006;27:340-5. Özcan M, Mese A. Adhesion of conventional and simplified resin-based luting cements to superficial and deep dentin. Clin Oral Investig 2012;16:1081-8. Zhang L, Wang DY, Fan J, Li F, Chen YJ, Chen JH, et al. Stability of bonds made to superficial vs. Deep dentin, before and after thermocycling. Dent Mater 2014;30:1245-51. Tjäderhane L. Dentin bonding: Can we make it last? Oper Dent 2015;40:4-18. Zheng P, Zaruba M, Attin T, Wiegand A. Effect of different matrix metalloproteinase inhibitors on microtensile bond strength of an etch-and-rinse and a self-etching adhesive to dentin. Oper Dent 2015;40:80-6. Belbons FB, Perdigao J, Aranjo E, Freir CA, Caldas DO, Cardoso JL, et al. Randomized clinical trial of four adhesive strategies in posterior restorations-18 month results. J Esthet Restor Dent 2015;27:107-17.